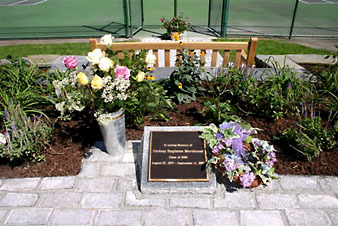 As long as there is an EphBlog, there will be a remembrance of the three Ephs who died on 9/11: Howard Kestenbaum ’67, Lindsay Morehouse ’00 and Brian Murphy ’80. Previous entries here and here. I have written a great deal about monuments and memorials, particularly those at Ground Zero in New York. 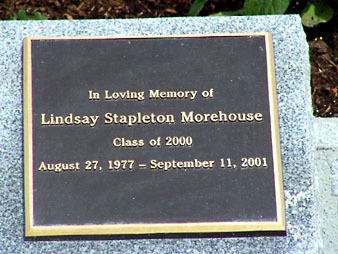 And in judging the design proposals, I always found myself thinking about Lindsay Morehouse, and what would be the appropriately dignified and heartfelt way to remember her. I met Lindsay in 1998 when she took my architecture course. This was a large class, about fifty students, but she was the first one I got to know, and all because of a terrific misunderstanding on my part. Long ago I realized how important the first day of a class is. This is where you can set the tone t, and if you want the students to feel that they can speak, and ask questions, and make comments, this has to happen in the very first class. By the second, it’s difficult; by the third, it’s too late. The invisible wall has come down. And so on that first day, you need to encourage students to make comments – so they can see that they will be listened to with appreciation and thoughtfulness, and not be snubbed. The professor cannot seem to be on a fishing expedition, wanting only to hear only a particular sentence. The instant he shows the slightest hint of disappointment over a student comment – or says those fatal words, “anybody else?” – the game is over. The freeze sets in and the class will never thaw. Therefore, to make this happen, I deliberately put a couple of images in my first lecture that invite questions – open-ended questions where there is no such thing as a wrong answer. If student don’t automatically raise their hand, I look for someone who seems just on the verge of asking. You can always tell who doesn’t want to be singled out. On that particular day it was Lindsay Morehouse I noticed, sitting in the second or third row on the right. She had that alert, pleasantly curious expression that tells you that she’s following right along, is engaged and responsive, and seems delighted to participate. What do you think? I asked her, and whatever she said was useful and helpful, because the class moved along happily afterwards, and I left thinking that the first class was a success. The next day I headed to my office hours, knowing that there would be no one there, because it was only the first week of the semester. But there was Lindsay, outside my office, evidently waiting for me. I could not imagine why, but when she stepped in I could see that her face was red. I asked her if something was wrong, and she began to weep. The she said a sentence that I can still hear almost twenty years later: why were you picking on me? It took me a moment to realize exactly what she meant, and then it was my turn to feel terrible. What I thought was relaxed banter in the class, she felt as if she had been cruelly put on the spot, without warning. I handed Lindsay a tissue, and explained just what I wrote above – that I did this on purpose, to create a certain exciting mood in the lecture hall where everyone feels allowed to comment and participate, and no one’s ideas are ever brushed off. I also explained how I looked for engaged and curious faces who seemed they wanted to comment, and that she seemed to be that person. And I told her this was the only time that I had read the signals wrong. It is a funny law of life that after a misunderstanding or any tense confrontation with someone, you tend to feel closer to the person. This was the case with us. For the rest of the semester Lindsay was a superb presence in the classroom –just as engaged and curious as I had thought at the beginning. 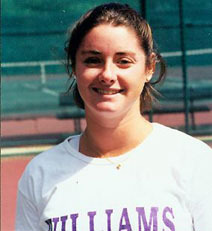 I soon discovered she was one of the stars of our tennis team and she often came to class in her tennis whites. 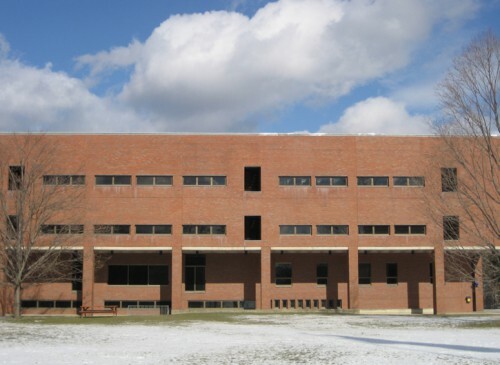 One of the assignments was to make a new facade for Sawyer Library in the style of one of the architects we studied, and she turned in an imaginative and fabulously witty Neo-Palladian design, complete with statues teetering on the parapet. I still have it. Lindsay showed she had a knack for architectural thinking and we even looked at creating a winter study project where she could do an advanced architectural project, but I was on leave and this didn’t happen. I later found out she had talked to her mother about this project, and her regret that we couldn’t make it work. 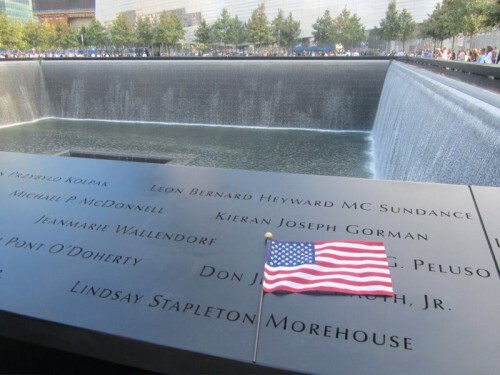 On September 11, I had heard that Lindsay had been working in one of the World Trade Center buildings. Two days later, the 13th, I was walking into my American art class, just about to launch into the second lecture of the year. 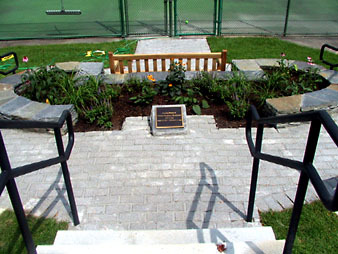 I happened to pass my friend Dave Johnson, our tennis coach, and asked if there was any news about Lindsay. This was that time of confusion when there was still hope that some people might be trapped in the subway beneath the building, and might be rescued. And to my shock, Dave said that the memorial service was going to be Saturday. He explained to me that there was no doubt that she was lost, and that she was on the phone as it happened. And so that is the symmetry of my relationship to Lindsay Morehouse, which began with her tears and ended with mine. A poignant post. Thank you, DDF. EphBlog is powered by WordPress and delivered to you in 1.038 seconds using 38 queries..